On this page you can find useful information about using Hall sensors, for special enclosures and applications, check the Applications page. We welcome any extra information and proposals to add to this site. Feel free to ask us any question. 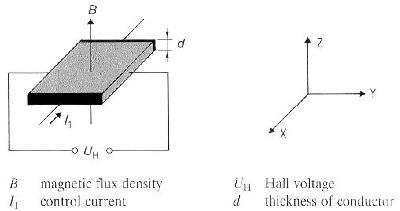 Hall effect sensors are made of a thin conducting material. When a current flows through the sensor a voltage in y direction appears across the current direction (x). 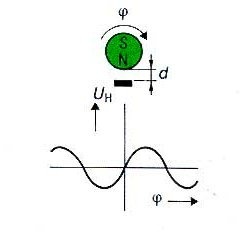 The magnetic field is applied perpendicularly to the conductor (z direction). 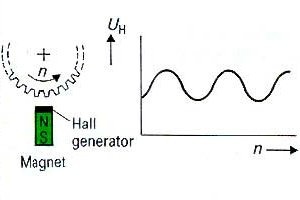 The output signal of the Hall sensor is proportional to the magnetic flux density and to the current running through the sensor. A Hall sensor is very versatile and can be used in many applications. Some, but certainly not all, are shown here. 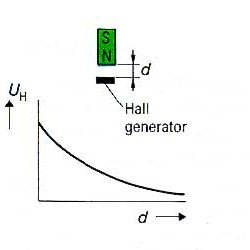 A Hall effect sensor can be used to measure the distance between the sensor and a permanent magnet or elektromagnet. This positioning can be done in a very precise way. 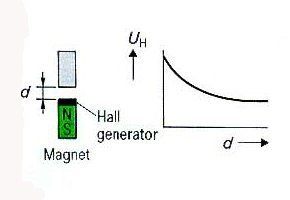 When a second Hall sensor (not shown in the drawing) is used at the south pole of the magnet, precise Hall sensors that are identical (like the Hoeben Electronics HE144), temperature of sensing and the temperature dependece of the magnet can be compensated. Leading to even more precision. 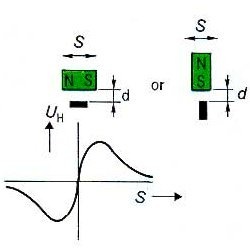 Horizontal movements of the magnet, or sensor, can also be measured. Angles of rotation of a magnet can be measured too. Of course the magnet does not have to be round. By using a second sensor, temperature compensation of the magnet and sensing can be accomplished. With rotated magnet or sensor, horizontal movements can be measured this way too. An array of magnets like you can find in linear motors can be measured this way. A very interesting possibility is measuring the position in or on a precise linear motor magnet array. The two Hall sensors give a sinus and cosinus, a SIN/COS signal, that can be used to measure the absolute precision with surprising position. When two sensors are used that are identical, like the Hoeben Electronics HE144 and HE244, temperature behaviour is automatically compensated and the postioning will even be more precise. To get a high resolution, the sensor needs to have low drift, low noise, a large range and a very good linearity and sensitivity at strong magnetic fields. The Hoeben Electronics Hall sensors fullfill these demands. Mounting a Hall sensor and a magnet in one device gives new possibilities. 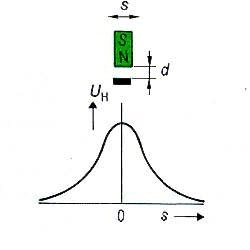 Non-magnetic ferromagnetic objects can be detected, and distances measured. Several metals have ferromagnetic properties and can be used, including some Stainless Steel versions. 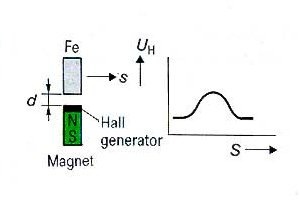 To be able to use strong magnets for a large range, and to be able to see very small changes, the Hall sensors must also show a good sensitivity for small changes in a strong magnetic field. The Hoeben Electronics Hall sensors can be used for this purpose very well. Even the strongest magnets available will not saturate the sensor. Also horizontal movements can be measured this way. And a lot more. Measuring teeth of gears is possible. A very interesting possibility is using a second Hall sensor to generate a sinus and cosinus in a SIN/COS signal to measure position. The Hoeben Electronics Hall sensors can be used for this very well. Hoeben Electronics Hall sensors can also measure current. 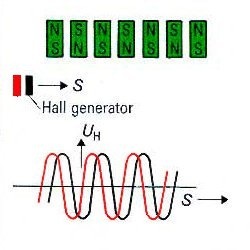 The drawing shows a current measurement with compensation coil. Without compensation coil is also possible. Using the line voltage as reference for the sensor current enables power measurements. True RMS. With some extra electronics, the cosinus phi can be measured too. 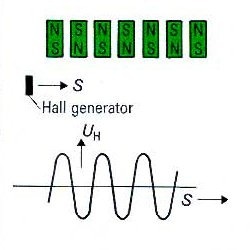 This example show a system without compensation coil. Windmills and solar cells often inject small erreonous DC currents ("DC Current Injection") in the lines. Values are in the milliampere range. These currents can be measured with the Hoeben Electronics Hall sensors too!